100% SOIL ASSOCIATION CERTIFIED ORGANIC - Our capsules only contain Certified Organic Turmeric (500mg) and Organic Piperine (10mg - Black Pepper). Our product is uniquely 100% organic! Only the purest Turmeric Curcumin with all of its health benefits including its natural anti-inflammatory and antioxidant properties will enter your body. This prevents pesticides from entering into our product and your body. CERTIFIED ORGANIC PIPERINE (Black Pepper) added to ensure excellent absorption. Turmeric alone is modestly absorbed by the human body. We want your body to be able to take advantage of every single health benefit of our Certified Organic Turmeric so we have combined it with Piperine. When taken with Piperine, which is black pepper, absorption is vastly increased thereby enhancing the benefits of Turmeric. ANTI-INFLAMMATORY AND ANTIOXIDANT - The natural anti-inflammatory and antioxidant properties of our Certified Organic Turmeric can provide relief to many ailments such as Arthritis, joint and muscle pains as well as enhancing your general wellbeing. 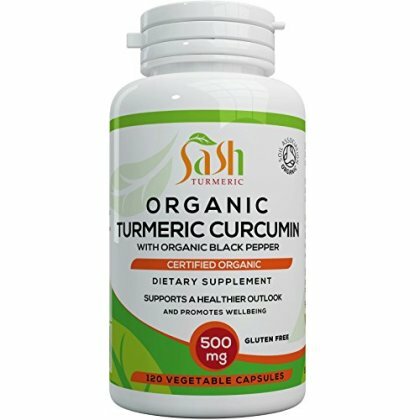 HEALTH BENEFITS - Turmeric Curcuma Longo / Turmeric Curcumin provides numerous health benefits which we have ensured remain in each capsule though our certified organic production. No irradiation or harsh light is used in order to preserve the natural anti-inflammatory and antioxidant properties of our Turmeric. From the elimination of certain skin conditions, to the prevention of both viral and bacterial infections, Turmeric has been the historically powerful go to supplement. HIGH QUALITY MANUFACTURING - BRC and GMP certified. We manufacture and operate in the UK and our capsules are produced to High Quality Standards so you can rest assured that what you are taking is safe and also suitable for Vegetarians and Vegans. No fillers, No Binders, No Bulking Agents, No Flowing Agents, No Artificial Ingredients. You are receiving a pure, natural, high quality, certified organic product.